First off I hadn’t realised it was Jamie Roberts 50th appearance for the club, so a belated congratulations to him. He played a heck of a game too. Only 7,600+ turned out for this rescheduled fixture, but what a game they saw! Not pulsating rugby but certainly enthralling, a game that seemed much closer than the final scoreline evidenced. An early indication of things to come came just after the start, as Demetri Catrakilis hoofed a long, long kick downfield nicely bisecting Homer and Faletau. Another indication followed the Harlequins line out when we formed a rolling maul and marched down pitch imperiously pushing the Bath forwards backwards. Warms the cockles of your heart that does, especially if you can remember when Bath used to turn up at the Stoop to marmalise our scrum and run round/through/over our backs. Finally, James Lang got his first kick in, a monster return down the touch line, all looking good. There followed some to and fro stuff, with good defence from Harlequins often preventing Bath from making much ground at all. Luamanu had the honour of giving away our first penalty, but it was on the halfway line so not too dangerous. A prop, I think it was Lambert, was having some help with a shoe that had come off, so I helpfully started shouting the instructions you give kids for how to tie a lace, e.g. “See the bunny go into the hole”. Probably as well he was too far away! A Bath penalty leads to a 5m lineout, but our excellent defence pushes Bath further and further back. Eventually spilt by Bath and Lang boots a huge relieving kick downfield, upsets some of the seagulls that have settled down the other end. Visser produces an amazing contortion to try and keep the subsequent kick in. Luamanu steam rollers Faletau, but Mr Doyle decides the ball was in touch. Shame! Now Lang messes up a simple kick gather, Scrum to Bath just the other side of our 22. It looks like nothing is on but somehow Fotuali’i speeds past Visser, who is simply a spectator, fixes his man, leaving Banahan unmarked on the outside with the easiest of run ins. James Wilson steers it wide of the posts so Harlequins 0 Bath 5 with 16 minutes gone. Oh no! Is this a sign of things to come? 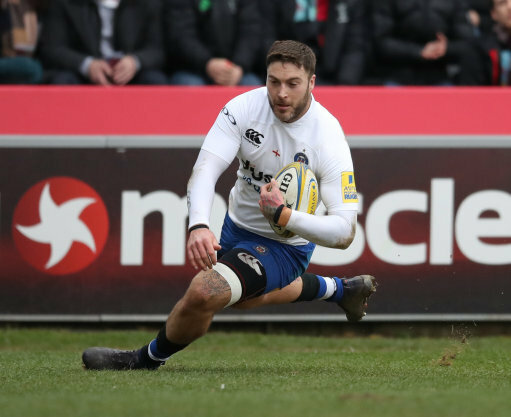 Defensive frailty by Harlequins and easy scores for Bath? More to and fro. Two lines of people strung out the width of the pitch. Occasional kicks. Neither team able to make much penetration. Bath get down into our 22 and look like they’re going to try and wear us down with pick and drive tactics. The ball comes out along the line, it’s all pretty innocuous, when as the ball is passed to Homer by Wilson there’s a streak of multi-colour. Is it a bird? Is it a plane? No! It’s Tim Visser already with the afterburners lit streaking through to snaffle the ball and take off for the posts with no-one near him. Poor Matt Banahan makes a token effort but honestly, unless he trips over a seagull, Visser has this in the bag. Fortunately he navigates to the posts easy enough, a nice dive to plant the ball and we’re surely 7-5 up? Yes we are. Try number 8 for Tim Visser this season, and never one more needed. Catrakilis slots the kick no problem and yes, Harlequins 7 Bath 5 with 25 minutes gone. Maybe this isn’t the foregone conclusion I had feared. From the kick off there’s a great take by Ben Glynn and Harlequins have the audacity to form another rolling maul and shunt Bath 15m upfield. We seem to have our tails up now. Next there’s a scrum where we force the Bath front row up. 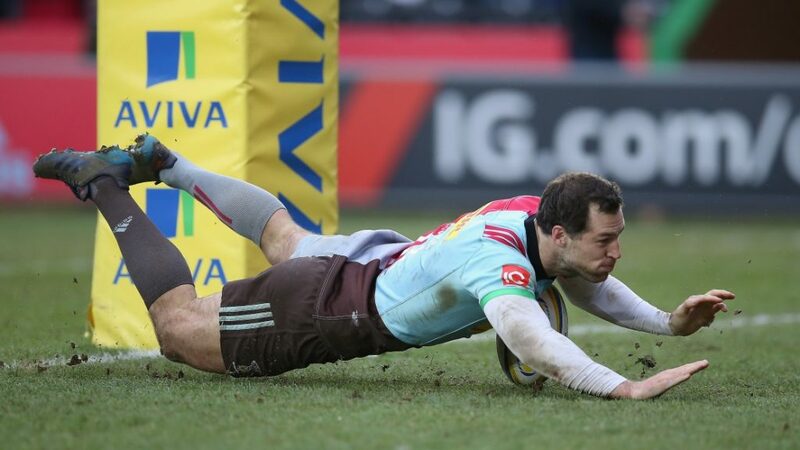 I have a grin the size of Surrey watching my team, my Harlequins, laying waste to a Bath pack. Henry Thomas tries some niggle on Lambert, hoping to get the penalty reversed, but Lambo is too wily to fall for that one. Henry Thomas adds to the good day he’s having by giving away a penalty for being on the wrong side. It’s straight on to the posts but about 40m out, so not sure if Catrakilis will get this. He’s only kicked 4 all season, and 3 of them have gone over. So fingers crossed! The Stoop hushes, he does his run up, there’s the thud of boot on ball and the ball sails over 50m but more importantly between the posts. That’ll settle his nerves. Harlequins 10 Bath 5 with 30 minutes gone. Who would have predicted this? But Bath will come back, surely? 5 points is no one’s idea of a safety cushion. We learn from the commentator that Catrakilis has a record in Super Rugby – 28 kicks in a row! He’s looking a better and better buy by the minute! Sound defence by Bath, but good attack from Harlequins. Alofa Alofa gets us up to the 22 but Lambert goes over the top and we wreck a beautiful attacking opportunity. More to and fro stuff. Harlequins are trucking it up when Bath take out someone off the ball. Less nervous about this one, but Catrakilis drags it wide. Rats! And that’s half time – Harlequins 10 Bath 5. But we could easily lose that lead. The second half starts as the first finished. Two lines of alternating defenders/attackers each trying to find the key to unlock the other defence. A long pause while Horwill has some treatment. Bath 5m from the Harlequins try line but lose it. Harlequins get a fortuitous penalty for offside and clear. Bath go through phase after phase but go nowhere. Harlequins eventually regain possession but a terrible pass from Roberts to Lang gives possession back to Bath. Ben Glynn swaps for Charlie Matthews. Henry Thomas gets penalised for a scrum penalty – he’s really not having a good day! Harlequins in the Bath half. A kick over the top releases Marchant. He makes ground but is tackled. Doyle blows for a tackle off the ball. Guess who did that? A certain Mr Henry Thomas, that’s who! Henry Thomas gets replaced at the next stoppage! Rats! In the second half Harlequins have given away 0 penalties, Bath 5 and we’ve only played 13 minutes. Bath infringe when we’re about 3m out. Yellow card to Max Lahiff who has only been on the pitch for about a minute. Harlequins took a quick penalty. Lahiff was standing about 1m away from where the kick was taken and immediately tried to tackle. No brainer for JP Doyle. Matt Luamanu (30th birthday on Sunday) Gets some treatment. Sinckler comes on for Will Collier. So Harlequins line out 5m from the Bath try line. We go side to side. Matthews tries to get over between the posts. Doesn’t make it. Horwill trucks it up another yard. Lewis passes it out to Sinckler – who charges over! Catrakilis slots the conversion and it’s Harlequins 17 Bath 5 with 55 minutes gone. Is this enough daylight for us to relax? I don’t think so. More to and fro. One minute Bath are on our 5m line, next we’re in their half. Marcus Smith is on for Catrakilis. So is Saili who is making his Aviva premiership debut! Horwill down for treatment again. Visser goes off for an HIA. Some technical discussion on who can be replacement. Sinckler gives away a penalty for side entry. Although it’s kickable Bath feel they have to go for the try. Some great tackling by Marcus Smith. He tackles, gets up and tackles again. Luke Wallace forces a penalty when Bath had been looking dangerous. We’re not hanging on by the skin of our teeth, but we’re certainly under pressure. From a line out in Quins 22 Mercer charges over but James Chisolm is underneath and there’s no grounding. Phew! 70 minutes gone. The strains of “Mighty Quinn” drift round the ground. Bath get a penalty on the 5m line. They take the scrum. Why? Desperate defence around the posts goes to the TMO. Try Yes or No? Chisolm is lying with his back against the post, so they can’t ground it against the post. Well done! From the resulting scrum we push them back a few yards. We turn it over 5m out! A clearing kick, a quick line out then Bath knock it on about 30m out. At the resulting scrum they give away a penalty and all the pressure is relieved. Honestly Bath could be Harlequins the way they’re playing! That was Lahiff, who seems to have taken on the mantle of Henry Thomas! Harlequins truck it up into the Bath 22. Another penalty against Bath for offside. It’s more or less in front of the posts and 3 points will prevent Bath getting a bonus point even if the score a converted try. It’s 76:30 gone. I’d say this is a no brainer. And indeed it isn’t. Marcus Smith steps up, Slots it beautifully. Harlequins 20 Bath 5 78 minutes gone. 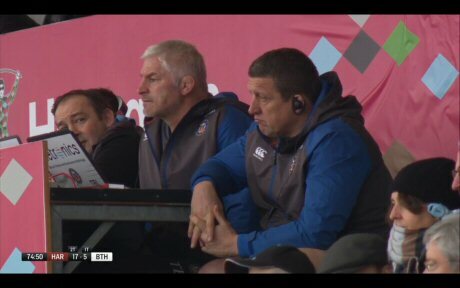 Bath coaches body language says it all. One last line out for Bath in Harlequins 22. They keep attacking, but we’re knocking them down time after time on the 5m line.Banahan tries one of his trademark “out the back door” passes. Marcus Smith is wise to this and intercepts. He’s got about 90m to go though and he’s no Tim Visser. Zach Mercer hunts him down and he slides into touch a scant 2m from the try line. 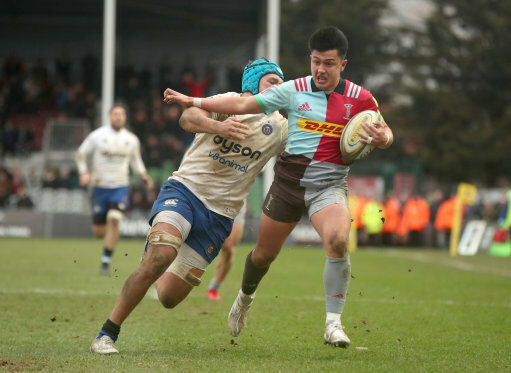 More harum scarum stuff as Harlequins push for another score. Eventually Lewis decides we’re going nowhere and kicks the ball out. A great win for Harlequins, absolutely needed. Great defence evidenced all afternoon. Now if we can build on that for the Saracens game……. Edited 1 time(s). Last edit at 2018:03:23:23:27:09 by DOK. I know what you mean about still not feeling safe! Good report DOK, caught the mood at The Stoop perfectly.